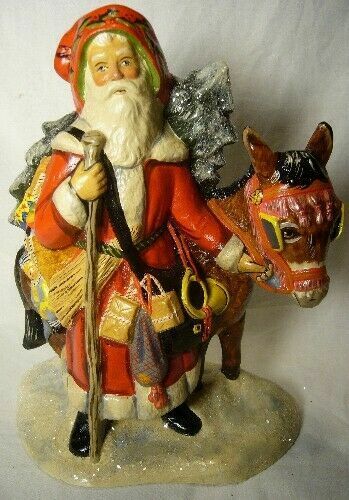 A Most Impressive Piece, Telling the Story of Father Christmas Delivering Gifts During the Christmas Holidays, on a Donkey. Lots of Great Details and Wonderful Face. This wonderful piece was from a Antique Chocolate Mould and beautifully hand painted from Judi Vaillancourt's inspiration by the Vaillancourt artists. It measures 9.5 inches and is in perfect condition. Start a Christmas Tradition and start collecting today to pass on to Generations.